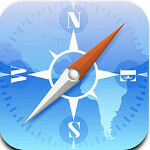 The latest stats from Net Applications shows that iOS continues to be the dominant platform for mobile browsing. Last month, iOS was responsible for 65.27% of mobile browsing, up from the 63.65% in May and the 53% reading from August of last year. Behind iOS was the Android platform with a 19.73% of mobile internet traffic in June. That is also up from last August when Android was responsible for 15.98% of mobile browsing. The third most used platform for mobile browsing is Java ME which can be found on many featurephones, and owned 10.22% of the mobile browsing market last month. 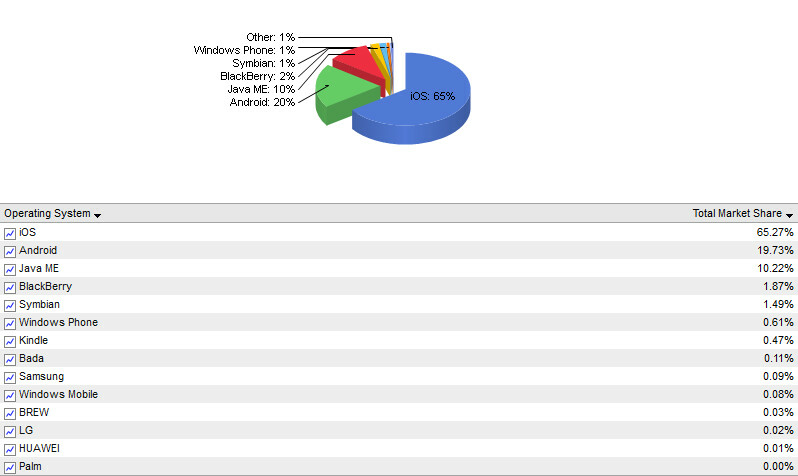 BlackBerry's 1.87% share of mobile browsing barely beats out the 1.49% for Symbian. Windows Phone is next followed by Kindle, with shares respectively of .61 and .47% Part of the reason for the large lead that iOS has over Android is the oft-cited statistic that the Apple iPad is responsible for 95% of the mobile web traffic for tablets. i mean i have an iphone and i use safari a lot but im thinking about downloading chrome and using that instead. its not worth switching yet... even tho safari is in need of some chrome like features... chrome for iOS itself is lacking at the moment. ill probably check it out and see how i feel about it. I call B.S on this one. More like Apple 55, Android 45. Android 20%? B.S. Actually you're just making an excuse. 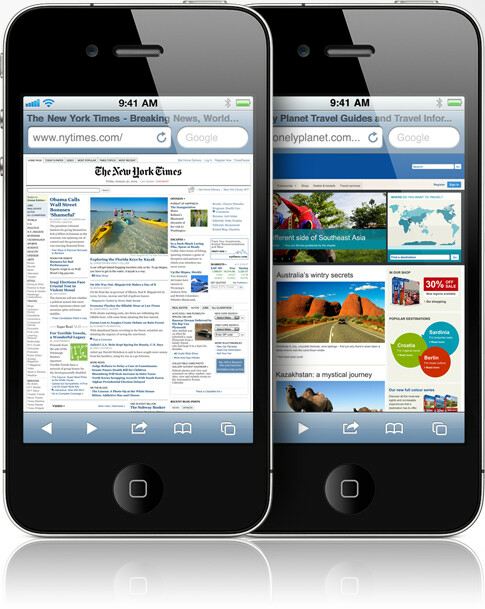 People just like the browsing experience better on an iPhone and that's why they use it more. Well according to recent studies a droid users aren't very tech savvy. Can't even turn on wifi. i dont own a droid and i can turn on its wifi. If you dont know how to turn on wifi on a phone you shouldn't own a smartphone. seriously. that wasnt a STUDY you moron, it was a Blog written by a person with an agenda that extrapolated his points from the most minimal of facts that had little to nothing to do with his assertions. Can you be more dumb?? seriously? Do you wake up in the morning and go "wow, i wonder just how dumb I could get!?" When you first turn on an Android phone, there is a widget right there on the home screen for toggling various things, like wifi, bluetooth, gps, etc. How credible do you think that study was? If someone can't figure out, that pressing that button on the homescreen that says 'Wifi' turns on the wifi, they shouldn't even have a smartphone. Really. Quit trolling, use some logic. Hopefully IOS 6 will help its uses turn on Wifi so they don't wind up getting stuck with a huge data overcharge. Joking aside, many sites recognize a mobile browser and then (badly) attempt to resize itself appropriately. On both Chrome and Dolphin, you can easily tell the browser to pretend to be a desktop browser, which makes that problem go away. Considering the sales and market share data available, it doesn't really make sense that iPhones/iPads are using 2/3rds of the data (assuming in the US) when so much of their competition is on LTE. I'm going to second the BS on this one. Well if you look at recent studies android users are technologically illiterate. 70% don't even know how to access wifi on their phones. Being that they can't do simple tasks it's not surprising they don't browse the web a lot. that was also an article written by alan f. PA's own eyesheep. You're missing it taco. Using more mobile data doesn't make a phone better or worse. I have no problem accepting that IOS users use more data if I could see a logical reason for it. In this case, it flies in the face of other things that we know for which we have more-reliable data. So a good (if speculative) argument for you would be that tablets use a lot more mobile data and Apple owns the tablet market, to which I would say that, in my experience, tablets are almost always used on wifi, and that just because phones are smaller, doesn't mean they use less data when observing content. Phones and tablets, with the notable exception of the iPad (don't call me 3), have about the same number of pixels. So I'm thinking but not coming up with a good reason to drive much greater usage on IOS than Android. And while your theory that IOS users are so much more intelligent than Android users that they consume data at a much higher rate is possible, so is the idea that earth is just one big intergalactic Truman Show. Possible but not terribly likely. I call BS because I can't make the study fit the evidence in a plausible way. i can see that the ipad would be a huge contributor to this study. more people would prefer to have the ipad at a cheaper cost and on a plan than buying it outright. The 4S was having accounts of exploding too, so don't even bring that up. Every phone has their faults, just some (like the GS3 and 4S) take it to the extremes. No you haven't proved it. Am I going to listen to a random Internet poster OR a professional company that analyzes data for a living. then you should leave the site, because you interact with random internet people, not a professional company.